Here’s an oldie but goodie deal that may interest some of you. 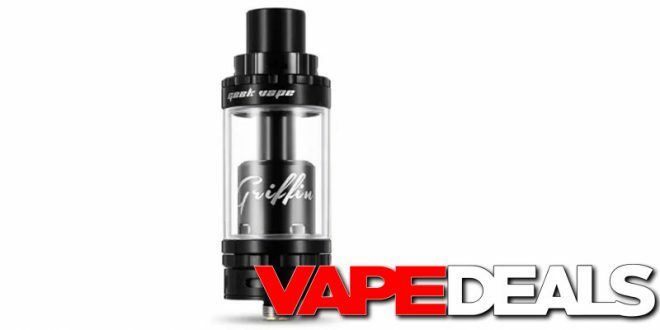 Eightvape is running a Crazy Clearance Deal on the GeekVape Griffin 25mm RTA right now. Their new low price is $9.99…but you can still use coupon code “GEEKVAPE10” to get 10% off ALL Geekvape products. That should drop the price down to an even $9. The silver colorway has already sold out, but it looks like BLACK is still in stock (standard bottom airflow version). **Also, keep in mind that Eightvape offers FREE shipping on orders over $10 (plus several other perks) if you sign up for their new membership program.